Although, in all honesty, their alternative names like Chirping Gecko are probably more accurate. 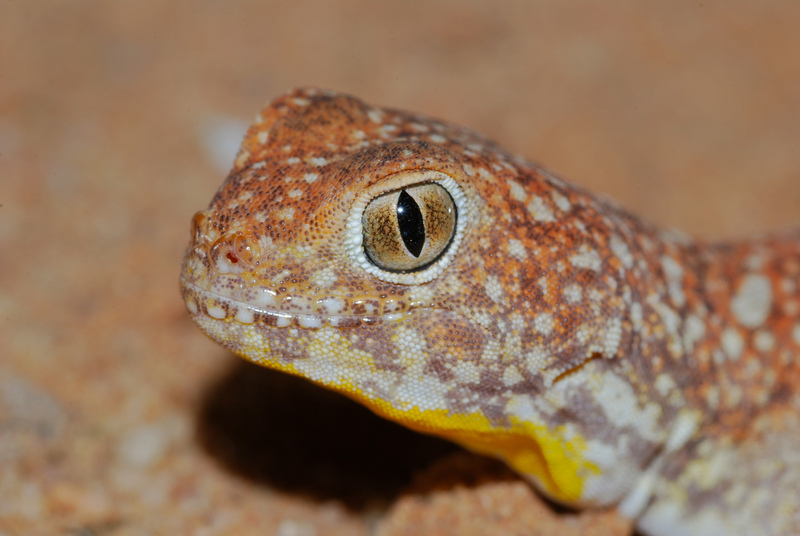 Whether they bark or chirp, these geckos are certainly talkative. 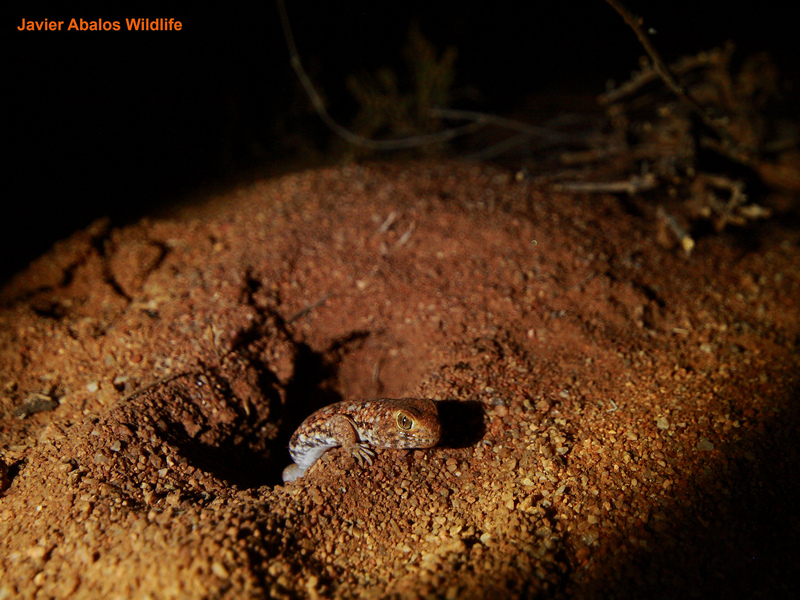 That's why the Common Barking Gecko is called Ptenopus garrulus, where garrulus means 'talkative' or, er, 'garrulous'. 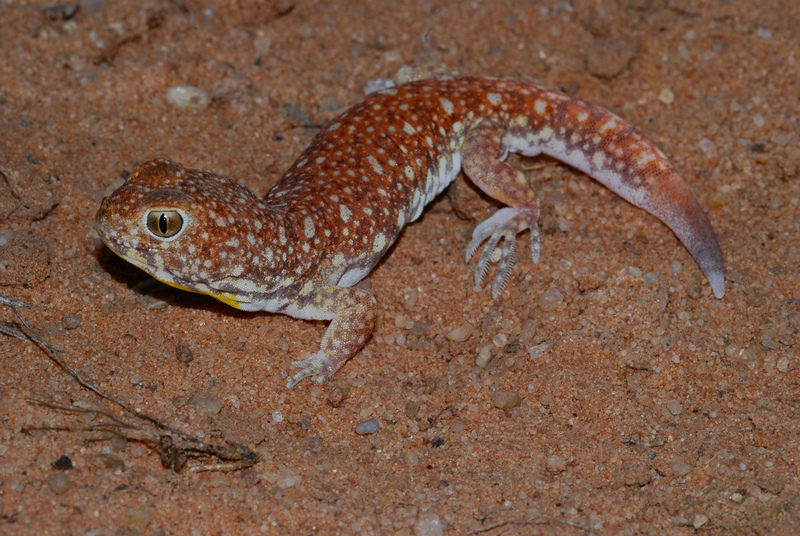 The other two species are named after people, Carp's Barking Gecko (P. carpi) and Koch's Barking Gecko (P. kochi). I'm sure Mr. Carp and Mr. Koch were exceedingly pleased with that but I've never met either of them, and I certainly wasn't invited to the lizard-naming party, so forgive me if I'm a lot more excited about garrulous geckos. Barking Geckos are small, at some 12 cm (5 in) total length, and found in arid parts of southern Africa. Geckos are famous for their sticky feet but that doesn't work in the desert. They wouldn't stick on the sand like they could stick on a leaf, they'd just have lots of sand stuck to their feet. 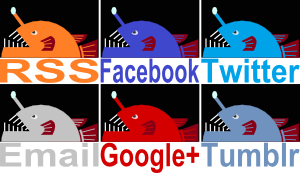 Which is different. So Barking Geckos completely forego sticky feet. Instead they have strange sticky-out bits on their toes which make them look like combs or feathers. That's where their generic name comes from, Ptenopus means 'feather-foot'. It provides them with enough purchase to run over loose sand without slipping and falling over. And Barking Geckos love sand! Not only do they walk on it, they live in it. They need the right kind sand - not too loose, not too stony - but when they find it, they dig out burrows that can reach a metre (3 feet) long. Here they hang out during the desert heat of the day. At night, they poke out and pounce on nearby insects. 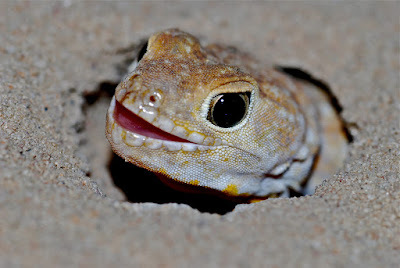 In the summer months, male Barking Geckos will poke their heads out of their burrows and bark (or chirp) into the cool, dusk air. This serves the dual purpose of warning other males to stay off their lawn and inviting females to come in and have a look around. It's a great trick to use a single sound to ward off one bunch of people and simultaneously attract another. Maybe it really is a bark and a chirp at the same time? Which leaves a lonely egg to hatch and a baby gecko to emerge alone in the darkness beneath the desert sands. Tough childhood. Enough to send them barking mad, perhaps. The first two barkings in the vid sound more like an ill-mannered person knocking on the door. I don't think I've ever HEARD of a single-egg-at-a-time reptile before. Somehow that is more interesting than the fact that it chirps. geckos are known (and named) for the noises they make after all. Yeah, it's strange. Nice, spacious nest for the hatchling, though!